I am a Navy girl ( went to NNSS Ojo and wished to be in The Navy too) so sometimes i tend to think military like and when there is any story that concerns the military i tend to wanna know more. When i heard about this i was extremely glad. It is about time someone stands up to the nonsense that is going on in the military. You don't play with people's lives even if they had sworn to protect our lives and properties and give up their own. As they are already willing agreed to sacrifice their lives that others may live free, let them sacrifice with dignity and pride not like chicken or cows going to a slaughter house. Dozens of women and children on Saturday forcefully stopped military trucks from ferrying their husbands and fathers to the Boko Haram-seized Gwosa by locking the exit gates of a barracks in Borno State, demanding quality fighting equipment for the soldiers. Scores of soldiers have been killed by Boko Haram in Borno State in the last few months, and many blame the inferior weapons Nigerian troops are equipped with to fight brutal insurgents. Reports say nearly 60 soldiers were killed last Wednesday in Gwosa, taken over by Boko Haram after hundreds of heavily-armed militants swooped on the border town. After locking the gates Saturday, the women and children placed themselves as wedges before the trucks that were to drive out of Giwa Barracks of the 21 armoured brigade Maiduguri, witnesses said. “We don’t want to be turned another set of widows, give our husbands modern and better arms, weapons and vehicles or they go nowhere!” one woman was quoted by a source as saying. The reaction came after nearly 60 soldiers killed in Gwoza and Damboa- both in Borno State- were given a mass burial at the Maimalari Barracks Maiduguri. The military authority at the 7-Division of the Nigeria Army received a mandate to send more troops to rescue Gwoza. Efforts to stop the women from protesting failed as they stood their grounds all day, demanding that the General Officer Commanding, GOC, of the brigade, address them. 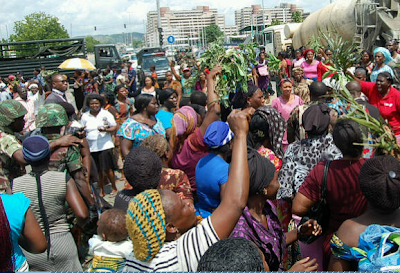 After defying all entreaties, the women turned on the barracks’ Regiment Sergeant Major and the Garrison Commander, and almost lynched them for trying to prevent the stand out, witnesses at the barracks told PREMIUM TIMES. The women and children also blockaded the roads leading to the barracks with stones and sticks, while some sat in front of the barracks’ gate. “We are ever ready to tackle Boko Haram terrorists but our superior officers are the ones killing us by not giving us the right arms to execute the war. How could I go and face Boko Haram with AK47 that is charged with only three cartridges when the enemy is brandishing modern GPMG, AA, RPG and so on. Most of our soldiers die every day like fowls because of faulty deployment and yet when you complain they only tell you to obey the last order”. “We are being pushed to death because we usually run out of ammunition or our weapons would fail us during an operation, while the Boko Haram who came fully kitted with better arms and extra supplies would continue to pick on us like insects." “We are ready to finish Boko Haram in one week because we have the courage to do that if we are given the right arms and ammunition”. With the sit in lasting al through Saturday, the hope of Gwoza people trapped up in the mountains diminished amid reports or some dying of hunger and thirst as at Saturday evening. I once said that there is a big problem why the military has not dealt properly with boko haram but i don't think people believed so now you all can see that the biggest hinderance are our leaders! All of them! The politicians and the military leaders!! The women should go to the Chief of defense staff and lynch him....TOTAL RUBBISH. Someone said that the women knew that their husbands were army men and it involves going to war and dying. No one is questioning that. They are military wives, they know the drill and are prepared for any outcome. However what they could not stand is sending them without any form of modern weaponery to give them an equal fighting chance. And of course as military wives they decided to upstage the Military leaders! Bulls eye!! Kudos to the women! And you all might be wondering why i support them, well it is not right and it is not right. Did i mention that it is not right? No one deserves that kind of treatment. And when the women are widowed, they (Military leaders) rarely remember to take care of the widows and their children.